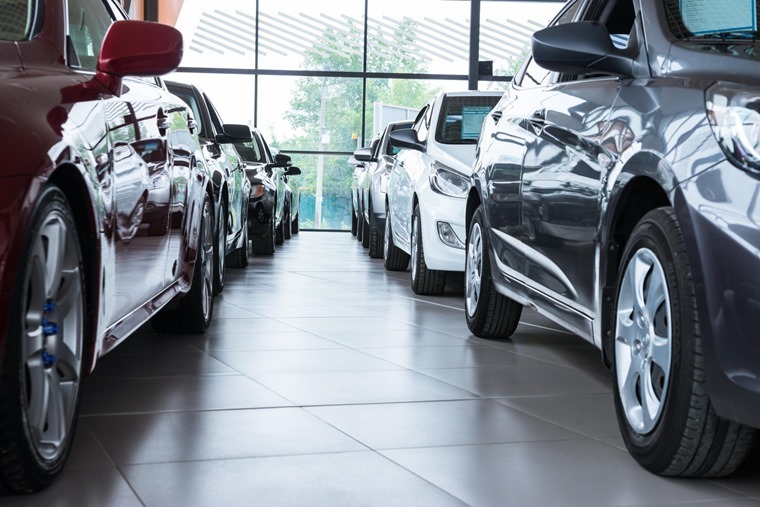 The European car market benefited from record registration figures during the first half of 2018, with 8.6 million new vehicles registered between January and June – a year-on-year increase of 2.7%. According to the latest figures released by JATO, Eastern European countries such as Romania, Hungary and Lithuania registered the biggest gains, increasing 33.4%, 29% and 24.6% respectively. Growth in larger markets remained strong too, with registrations in Germany, France and Spain increasing 2.9%, 4.6% and 9.4% respectively. 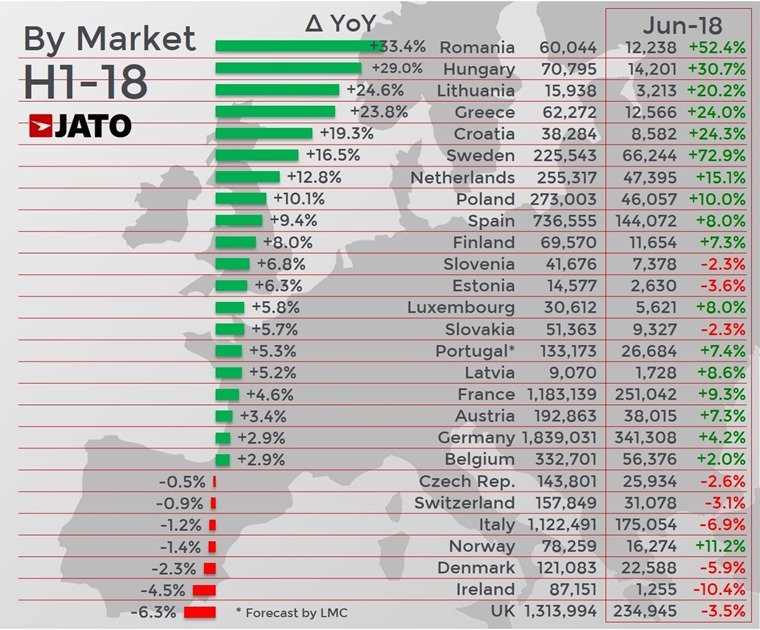 However, it was bad news for the UK, where new registrations shrunk by –6.3%, making it the worst performer in Europe. A decline in diesel registrations combined with continuing uncertainty over ongoing Brexit negotiations has been blamed for the UK’s poor performance. Elsewhere, Switzerland, Italy, Norway, Denmark and Ireland also posted negative results. The diesel decline continued during the first six months of 2018, as registrations were down by 17%. The fuel type accounted for just 37% of the total market – its lowest share since 2001. Diesel’s biggest declines took place in Norway (-32%), the UK (-30%), Slovenia (-28%), Finland (-20%) and Belgium (-20%). The figures show it is largely the burgeoning SUV sector that’s responsible for the positive results, with new models such as the VW T-Roc, Citroen C3 Aircross, Seat Arona and Skoda Karoq increasing the segment’s market share. There were 2.92 million SUV registrations in H1 2018, a result that marks the best-ever performance for the segment in Europe. SUVs grew by 24% in H1 and by 30% in June, signifying that the boom won’t be slowing down anytime soon. 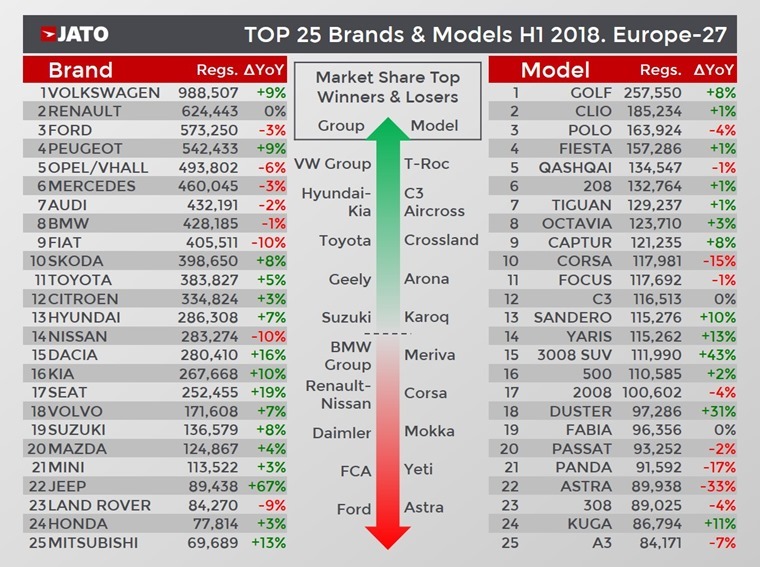 Despite the SUV sector’s impressive growth, however, it was the ubiquitous VW Golf that you’ll still find in first position overall, with it remaining the most popular car in Europe; it was the top-selling car in Germany, Austria, Luxembourg, Latvia and Belgium. VW Group was the top-selling car maker in Europe again, too, but it can now also claim to be the top-selling SUV maker. Meanwhile, PSA recorded only moderate growth, due to the negative results posted by Opel/Vauxhall, which saw a 6% decline during the first six months of the year. Renault-Nissan was the third best-selling car maker in Europe, but lost market share due to stagnating registrations within the Renault and Nissan brands. However, they were boosted by the Dacia range, of which the new Duster and Sandero models performed very well.